Sewing machines are a basic need of every household. You need one to help you out in mending, and making custom and tailored clothing. You need a machine that compliments your sewing skills. Sewing isn’t an easy job, especially not if you’ve got a rundown machine. But finding the right sewing machine can be quite a task, right? However, you don’t need to worry anymore! Juki is known for their vast collection of high-quality sewing machines. 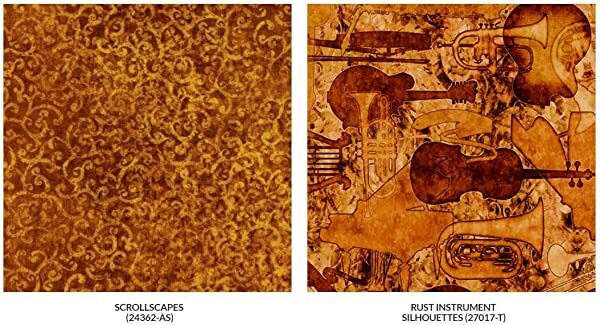 You can easily find one that suits your requirements. In this article, you’ll discover a hot number; the Juki MCS-1500. You can find out why this is such a sought out product. 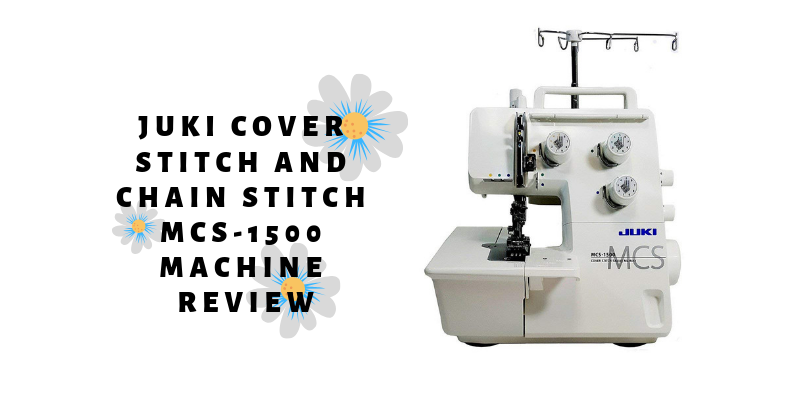 Simply keep reading this Juki MCS-1500 Cover Stitch and Chain Stitch Machine review to find out more. Chain stitches are ideal for stitching the waist and the side seams of pants. The lower thread helps by creating a chain on the wrong side of the fabric; this gives the stitch the extra-protection and makes a strong for when it gets stretched. These stitches are also great for decorative stitching for the necklines. 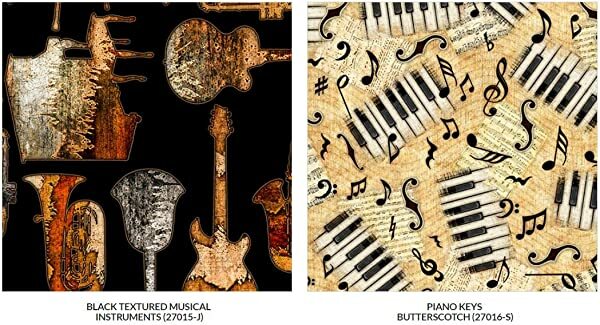 Meanwhile, cover stitches are used for all-around work and happen to be quite versatile. You can use these stitches for hems, necklines and sleeve cuffs. Simply put, they can be used for almost every project you might have up your sleeve. The MC-1500 features a presser foot lifter. The presser foot is as high as its tip; this allows you to insert the fabric when you start sewing easily. Also, you can raise the presser footer addition to 8mm and 10mm, after having raised it to the original. This allows you to insert thicker fabrics with ease. The machine’s looper can easily be threaded; you don’t have to squint your eyes while threading the looper. Instead, the machine allows you to lower the looper easily with just a touch of a button. The MC-1500 features an adjustable differential feed, and this allows you to be able to sew stunning finishes. This feature works well with stretchy fabrics as well. Plus, you can use it for a variety of materials including georgette and knits. The machine’s extension plate features some helpful seam guidelines that allow you to sew straight stitches. Thus, they make your work look at more professional, neat, and clean. Juki has made it its aim to provide its users with extra control over their work. 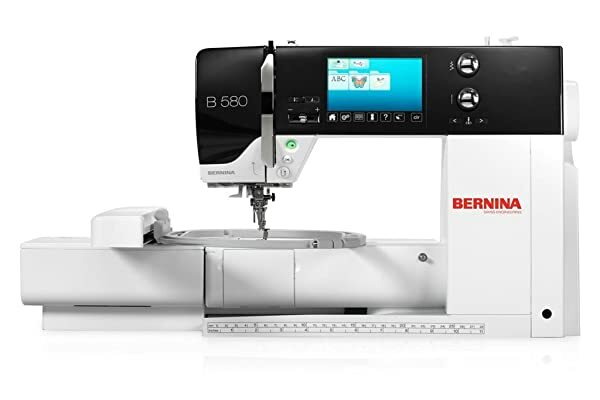 With the MC-1500, you have the complete control over your sewing experience. You can adjust the presser foot pressure to fit a variety of fabrics. This enables you to use all sorts of fabrics with ease without having to worry about them bunching up and getting stretched out. One feature that often gets overlooked and is highly underappreciated is a thread cutter. Exterior thread cutters help in making sewing so much easier. Plus, you can easily finish your stitch and get on with the rest of your work without having to make any extra effort. The MC-1500 features a thread cutter which makes it easy for sewers to finish their sewing. In addition, the cutter allows them to remove the fabric after lifting the presser foot. The MC-1500 includes a presser foot guide to further help in creating the perfect stitch. The guide is a standard accessory, and it presses down on both the left and right sides. The presser foot guide along with the seam guide on the extension plate allows you to create straight stitches. The machine features an automatic roll hemmer that helps by rolling the edge of the fabric over itself two times. This then hides and secures the edges of the fabric. The roll, while being held in the rolled-up position, is then sewn over. The machine’s automatic rolled hem feature offers its users two different modes. The first mode allows you to roll over the end of the hem. Meanwhile, the second mode provides a strong overlock stitch for providing extra durability. When using either of the methods, this feature offers the cleanest edge possible. One thing great thing about this machine is that it features fast speed. The MC-1500 allows users to sew up to 1,350 stitches per minute. 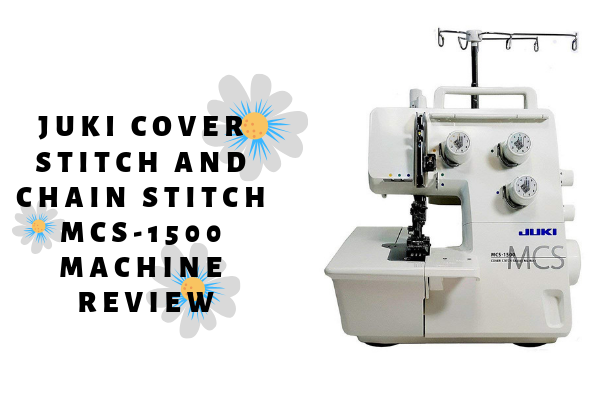 It allows you to sew some of the fastest cover stitches, making one’s life a lot easier. You can quickly finish all of your projects with this zippy machine. 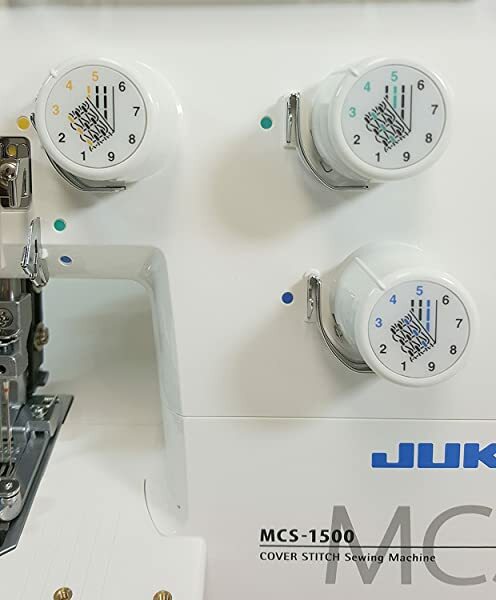 The JUKI MCS-1500 has a blinding speed; it can offer 1,350 professional-quality stitches per minute. It includes an easy to understand user manual. Moreover, it includes an informative instructional video in both English and Japanese. The machine features multiple needles. With three needles, you can create both 3 and four thread chain stitches and cover stitches. 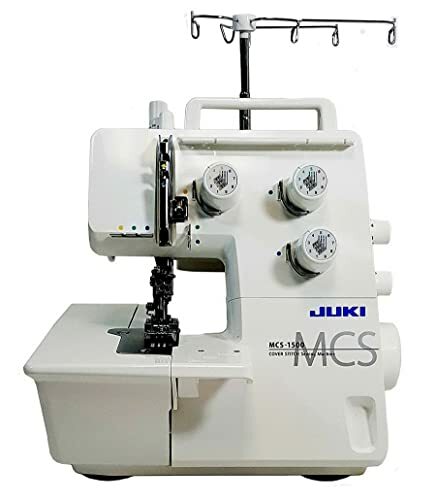 The JUKI MCS-1500 is sturdy; it is made using high quality material and is extremely easy to use. The JUKI MCS-1500 weights about 20 pounds. Thus, this machine is comparatively heavier than all the other portable models. The machine includes superior features and functions which makes it a lot more expensive compared to other models. If the price point isn’t an issue and you don’t have to take the machine with our everywhere you go, then the JUKI MCS 1500 is a great option for you. This machine is visually pleasing. It is easy to use the machine; it comes equipped with a color codes guide and a video to make things a lot easier. The machine is user-friendly, especially one you get the hang of it. With the different stitches it offers, you can use this machine for almost every type of clothing. It also includes additional features which make your work clean, neat and very professional looking. This machine is worth investing in and is suitable for both experts and beginners alike.